This box was provided to me gratis in exchange for photography. All opinions my own. 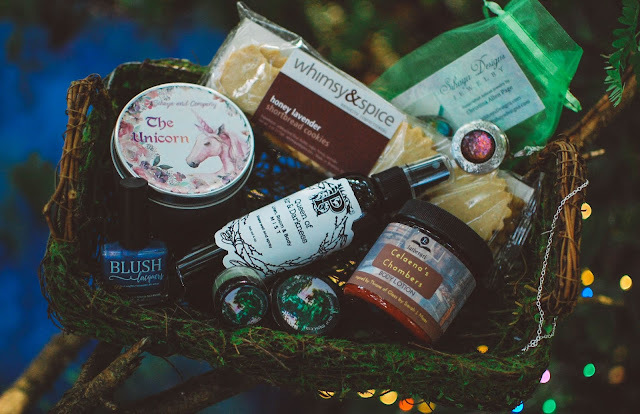 Last year I purchased a Sisterhood of the Moon fall box from Sihaya and Company and loved every last bit of it (review here). Sihaya and Company offers seasonal boxes in a pre-order, single purchase format which I really enjoy for its ease and simplicity. The summer box was themed Journey Into Mystery and had an enchanted fantasy feel with a dash of European forest and castle whimsy ($65). This box included eight items from six vendors. Almost all of them were full sized products. I will start with the edible portion, a generous 12-pack of Honey Lavender Shortbread Cookies from Whimsy & Spice out of Brooklyn ($8.50). These cookies are the perfect accompaniment with hot tea or coffee. They have a buttery delicate soft crunch. The lavender and honey are merely wisps of flavor highlighting the butter. Delish. At the bottom of the basket you can see two tiny jars of cosmetics. 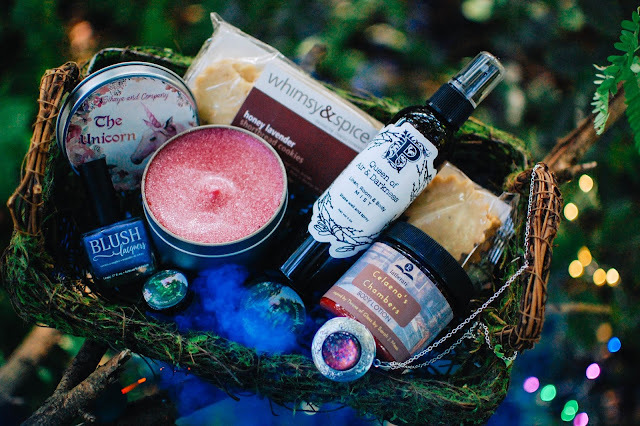 These are from Crow & Pebble, a UK based handcrafted cosmetics company. They included exclusive half sizes of an eyeshadow ($4) and a highlighter ($6.25). The eyeshadow is in Asleep Under the Willow which looks the color of lemony spring grass with golden shimmer highlights. It is a beautiful green shade that has nice color payoff and lasts for hours even without a primer. The highlighter is in The River Daughter and holds a pearlescent pink hue, the color of the heart of a seashell, with hazy golden shimmer. This is a touch pale for me to use as blush but does act as a wonderful highlighter as it is meant to be. It is easy to blend and does not make me look like a disco ball. I don't often use indie makeup but these were exciting to try out. 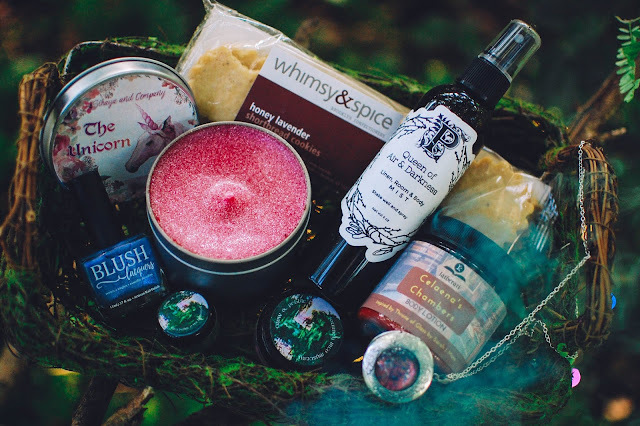 Sihaya and Company not only curates these brilliant seasonal boxes but the owner, Christina, also creates her own line of jewelry and candles. 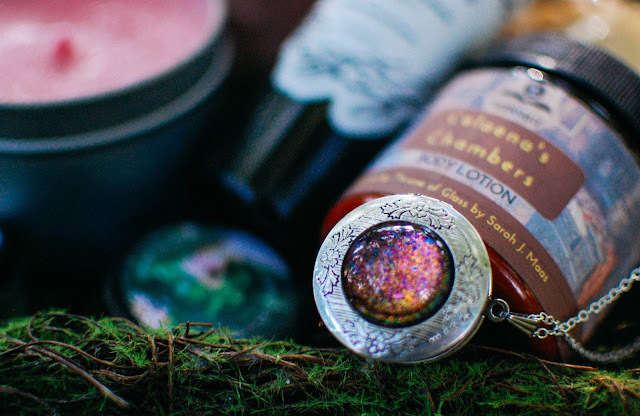 This locket necklace features silver plated findings and a color shifting resin cabochon. I am not sure of the exact value of the necklace but there is a similar silver locket, here, for $42. Poesie Perfumes is a perfume house I have reviewed before in the past so when I saw this room and linen spray I was excited. This 4 ounce vegan fragrance mist can be used as a body spray as well. This is gorgeous. Sweet dark berries and floral yet earthy dragon's blood lulls the senses into quietude. I sprayed this on my pillow and in my room and it was lovely. It lingered delicately on my pillowcase for most of the evening and long enough for me to fall asleep. I will be buying more of these for sure. I see that Poesie Perfumes has these in stock in many other fragrances (plus free shipping). I have burned and enjoyed a few Sihaya and Company candles. 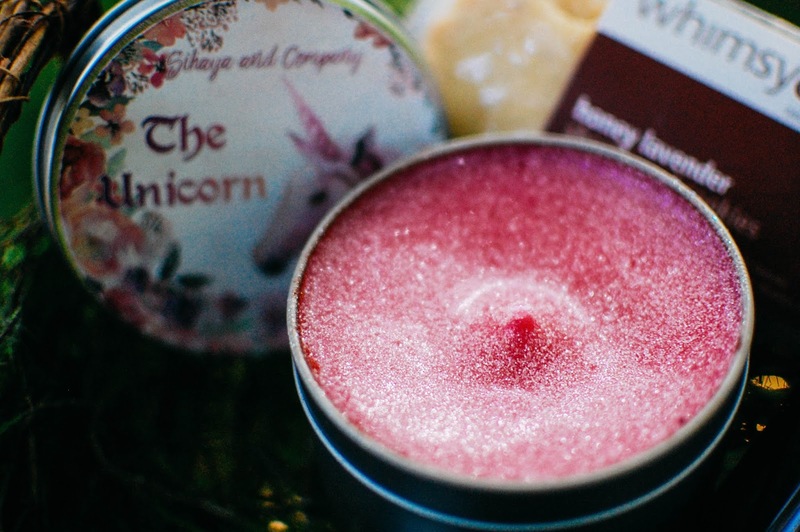 They come in sturdy tins with lovely labels; they are about 8 ounces and burn 30-35 hours and run $12 each. The Unicorn- Notes: Only those truly pure of heart can glimpse a unicorn. A sweet and innocent confection of rainbow sherbet topped with coconut shavings and a cherry. A bright and fruity treat where the coconut shavings give it a slight bakery tone. The cherry is creamy and almost like serendipity. It certainly smells "pink" and youthful. It burned beautifully, like they all do, with a steady flame and a slow melting wax pool. The scent threw medium-strong in my bedroom and mostly smelled of candied fruits, festive and jovial. The coconut just added a mellow creaminess and did not come over as bakery once melted. A magical summer scent. 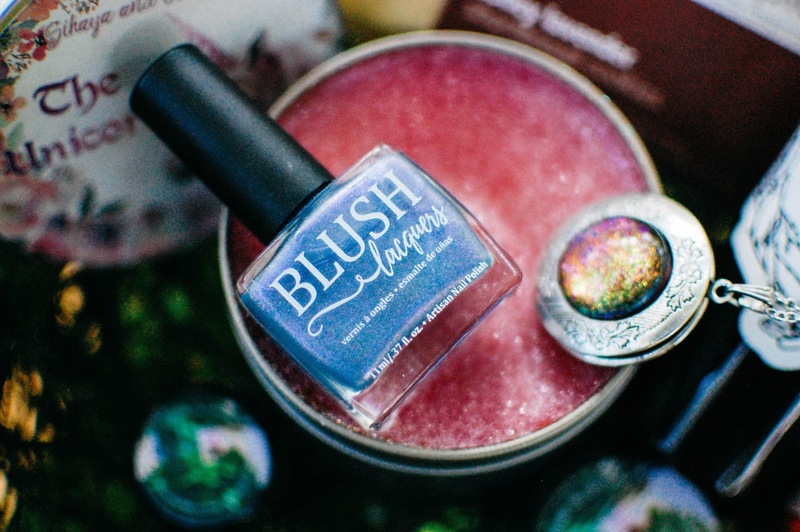 An exclusive nail polish from Blush Lacquers featured in the box. This 5-free artisan nail polish vendor created Evenstar, a blushing periwinkle shade with violet highlights, electric blue microflakes and holographic pigment. It has a nice wide brush, much like OPI. Two regular coats was enough to cover visible nail line and achieve a beautiful shimmery opaque look. It dried reasonably fast. It wore well, staying chip free without a top coat for several days. Evenstar is a fitting name as it does glow mysteriously and beautifully. Blush nail polishes run anywhere from $8.50 to $13. A four ounce vegan body lotion from Latherati lied nestled in the box. This scent was inspired by the Throne of Glass series by Sara Maas... which I desperately need to finish. I ended up stopping at book three waiting for the next to come out and know I think two more did. Oops! I am rather impressed by the scent blending here. The lotus blossom is decidedly aquatic and watery but it is warmed and tempered by the subtle spice and rich wood. The rose lends a vintage nostalgia to the scent. No one note overpowers the other and it melds together to smell elegant and sophisticated. The cream is silken and thick yet easily spreadable on the skin. It sinks right in and is a great formula for summer time. 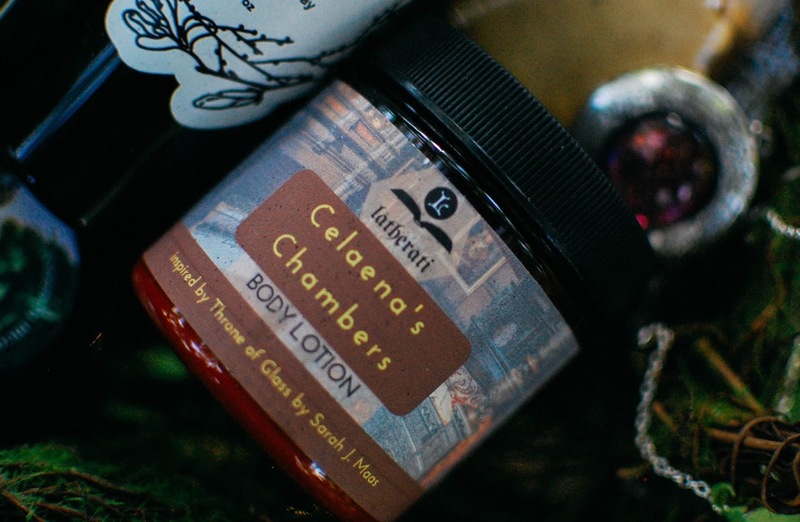 I will be back to Latherati, they sell wax tarts, lip balms, milk bath soaks and even bookish gifts, as most of the scents are inspired by literature. The value of this box is about $60 not including the necklace. If the necklace is around $45 then the total value of the box hovers around $105. Everything in the Sihaya and Company box is high quality and very tasteful. The Autumn Delights box is debuting today, August 1st, and will include a gourmand collection of scents and flavors, everything apple, pumpkin, caramel and coffee. This is one for the foodies and fall lovers. Check it out here today! Have you tried a Sihaya and Company box yet? Do you enjoy seasonal box offerings?